I’ll let you read through the post itself to familiarize yourself. Never before has anyone tried to tie real, tangible, financial results to likes, follows, comments, posts, and so on and so forth. We know the value of social media. It’s networking, listening, identifying new customers, etc. Selling it to the C-Suite can be difficult as the bottom line is the only number they are concerned about. 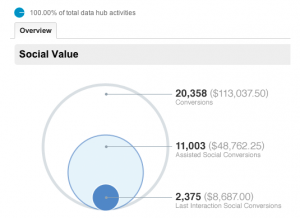 This provides a tool that provides realistic numbers as to conversions, and where those conversions are coming from. This is not a be-all-end-all tool, but it certainly is a step in the right direction.